This entry was posted in Uncategorized and tagged Absolutely Fabulous, bee, carpet rose, Crême de la crême, Crown Princess Margareta, fuchsia, heucheras, hydrangea, Love Knot, Margaret Merrill, paths, petunias, Summer sculpture, verbena bonariensis by derrickjknight. Bookmark the permalink. I quite like the rustic look of the bleeding arch. Love the alliteration and the paths are pristine!! The rustic look goes well with the theme of the garden and the Head Garden (Mrs Knight) always knows the right place to put the various relics. Have you started on any ideas of what will be grown in the hot house? Mrs K. is a dear! My apologies, Jackie, yes I meant greenhouse. You are well prepared! I did not know hydrangeas were propagated by cuttings. Such beauty! I love the photo of the white rose and orange! most welcome. I love the white one it looks like it is suspended in air! Your garden is so beautiful. And you’re right–the lovely weed-free soil and the paths are as interesting as the flowers and add to the overall loveliness. I’m amazed that Jackie has time for cooking too. You have a treasure, Derrick. There is so much passion and perseverance in those ‘pre-prandial potations’. Watch your bleeding language young man! Roses! I do love roses. Can’t grow them where I am at-too much wind and critters (deer think they are a delicacy!) So I will enjoy them vicariously through you! You treat us to so many beautiful photos on a regular basis that we come to expect nothing less, and then you give us one like this that is simply stunning, really reminding the reader that the composition may have been formed by Mother Nature (with help from the Head Gardener, of course) but it takes the eye of the photographer to put it in a frame. What a wonderful comment, Oglach. Very many thanks. That last picture is fabulous! What a shot! Love those orange roses, so beautiful! They all so beautiful – But I hope you never need to paint over that beautiful old shed at the back of the rose garden. Even then1 it will be a shame. Flowers (fruits) of hard work are always beautiful. What a beautiful gallery of your garden! Fabulous. If my garden looks anything like yours in a couple of years I will be so pleased. I won’t plant roses though, I don’t especially like roses. 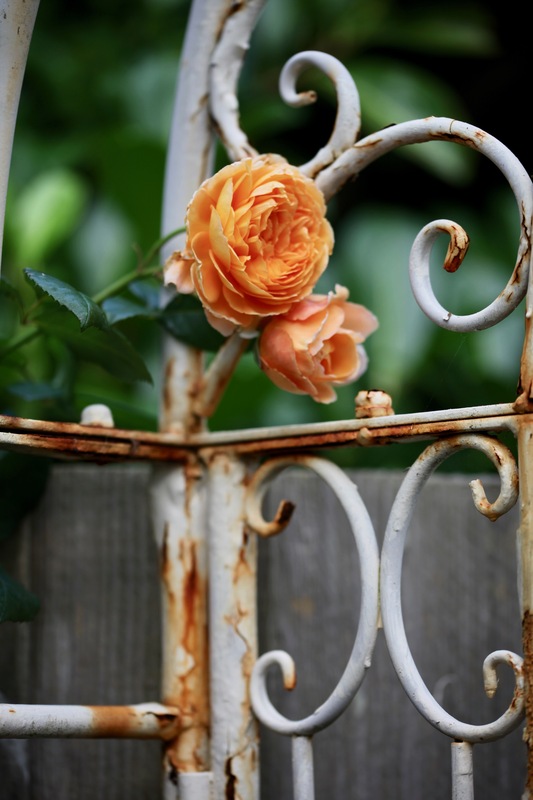 I do like the rusting iron, it needs a coat of paint of course but that will spoil it! My first thought when I read your title reminds me of a mistake in a student’s essay I’ve just marked: ‘flipping classroom’ instead of ‘flipped classroom’. Anyway, I will now enjoy reading your blog. I like the bleeding arch. In fact I loke the whole bleeding garden.